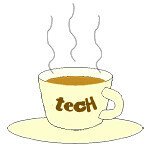 upgrade « Tech bytes for tea? Adobe’s latest Creative Cloud Release drives deep connections between new family of mobile apps and enhanced CC desktop tools via all-new Creative Profile. Adobe President and Chief Executive Officer Shantanu Narayen, (right) and Microsoft Chief Executive Officer Satya Nadella take the stage at Adobe MAX 2014. At Adobe MAX 2014, Adobe today announced it is shipping a milestone release of Creative Cloud that transforms how creatives work across desktops and devices. This major release includes significant feature updates to 13 essential CC desktop tools that link to a new family of integrated mobile apps. Today’s updates to Creative Cloud are expected to be available to Creative Cloud members by the end of the day as part of their membership at no additional cost. The new and updated mobile apps are free to everyone. In addition, the latest versions of Photoshop CC and Illustrator CC include breakthroughs in Touch support for Microsoft Windows 8 and Surface Pro 3. Central to this release is an all-new Creative Profile that drives deep connections between CC desktop tools and 9 new mobile apps that extend the power of the Photoshop, Lightroom, Illustrator and Premiere franchises onto mobile devices. The Creative Profile is a subscriber’s creative Identity within Creative Cloud. This launch is part of the latest WeChat upgrade – which also offers users with new animated stickers, group chats upsize of up to 100 members and more. WeChat Games – a place where you can challenge your friends with fun and addictive games while you’re on the move. Gaming gets social with the Singapore launch of WeChat Games! Pit yourself against the best around your neighborhood with WeChat’s location-based service, find competitors nearby and beat the top scorers. “The new WeChat upgrade opens a whole new paradigm of mobile social networking with the enhancement of existing features and introduction of WeChat Games which provide greater social interaction and sharing with their friends,” said Louis Song, Country Manager, Singapore and Malaysia, International Business Group at Tencent, the company behind WeChat. You can now challenge your friends to a host of WeChat Games and gloat when you beat them with new animated stickers from the Sticker Shop. And the fun doesn’t stop there. You can also share your life through pictures and personalised captions with StoryCam for WeChat – a photo app by Tencent. Spice up any conversation and get your friends laughing by sending them stickers from the WeChat Sticker Shop. For a start, check out the following games on WeChat Games. WeChat 5.0 introduces a sticker shop with online payment. WeChat 5.0 for iOS is now available for download. WeChat 5.0 for Android will be available at a later date. The launch of WeChat 5.0 further enriches the user experience. “The new WeChat 5.0 moves the platform beyond a simple chatting app and enriches the user experience by being a truly mobile social platform. Users not only meet, chat and share moments, pictures and videos with friends and people they care about in an innovative and fun way, they do it in a dynamic and intuitive fashion,” said Poshu Yeung, Vice President at International Business Group at Tencent, the company behind the WeChat app. It had recently announced that it had passed 70 million registered user accounts internationally. With the WeChat 5.0 comes the introduction of the Sticker Shop which is supported by online payment. Users download and pay for stickers via the platform. Also new with the WeChat 5.0 is the ‘Hold Together,’ a location based service that allows users to further find and connect friends who are close to each other. Along with ‘Shake’ and ‘People Nearby’ (previously called “Look Around”), users are able to connect with friends with just a simple touch of the screen. Microsoft has released prices for Windows 8 after 31 January 2013 – when the current promotional prices expire. The new prices are much higher, so if you’re planning on upgrading to Windows 8 – get it before the end of this month. An auspicious 88 days for Windows 8. Click to enlarge. 88 days have passed since the global launch of Windows 8, with 60 million licenses sold, (as of 8 January). Top eight Windows 8 apps developed locally. All of them are free apps. Since the opening of the Windows Store the number of apps has quadrupled and globally Microsoft recently passed the 100 million app download mark – just two months after general availability. In Asia-Pacific, the number of locally-developed apps is currently being added to at a rate of 50 per day and the developer community itself has swelled by 82% since the October launch. In Singapore, more than 4,000 developers have been trained to develop apps for Windows 8 since launch. Below are the prices for the various upgrade editions for Windows 8 from 1 February 2013. Microsoft Windows 8 has become available to consumers and businesses in 140 countries and 37 languages today. Here are the Singapore prices (valid until 31 January 2013) for upgrading or purchasing the new operating system. Promotional offers within. These promotional prices are valid until 31 Jaunuary 2013. Microsoft has released the increased prices starting from 1 February 2013. Windows 8 is now available to consumers and businesses around the world. You can get Windows 8 bundled with new computers that you purchase; upgrade from existing Windows 7, Windows Vista and Windows XP; or new installation. Buy Windows 8 with device Varies Depends on device purchased. Upgrade from Windows 7 (after 1 June 2012) S$17.99 Customers who bought a Windows 7 PC between 2 June 2012 and 31 January 2013 can upgrade to Windows 8 Pro here. Upgrade from Windows 7, Windows Vista or Windows XP (before 1 June 2012) S$49.99 For a limited time, customers who bought a Windows 7, Windows Vista or Windows XP computer before 1 June 2012 can upgrade to Windows 8 Pro here. Purchase a new packaged DVD from a participating retailer. S$89.99 Limited time Windows 8 Launch offer: get a FREE Canon PIXMA MP237 Printer worth S$79 while stocks last. The ninth major release of Apple’s desktop operating system is now available as a download from the Mac App Store. Mountain Lion is available as an upgrade from Lion or Snow Leopard for S$25.98. Mountain Lion OS X, Apple’s new desktop operating system is available for download today. Mountain Lion features more than 200 new features, including iCloud integration, the all new Messages app, Notification Center, system-wide Sharing, Facebook integration, Dictation, AirPlay Mirroring and Game Center. Facebook integration will be available in an upcoming software update to Mountain Lion, while Dictation supports English (US, UK and Australia), French, German and Japanese. OS X Mountain Lion is available from the Mac App Store for S$25.98. Mountain Lion requires Lion or Snow Leopard (OS X v10.6.8 or later), 2GB of memory and 8GB of available space. A complete list of system requirements and compatible systems can be found here. OS X Server requires Mountain Lion and is available from the Mac App Store for S$25.98. The OS X Mountain Lion Up-to-Date upgrade is available at no additional charge from the Mac App Store to all customers who purchased a qualifying new Mac system from Apple or an Apple Authorised Reseller on or after 11 June, 2012. Below are some of these key new features. The new Messages app, which replaces iChat and brings iMessage to the Mac, so you can send messages to anyone with an iPhone, iPad, iPod touch or another Mac. Dictation, which allows you to dictate text anywhere you can type, whether you’re using an app from Apple or a third party developer. The new Gatekeeper, which makes downloading software from the Internet safer. Power Nap, which automatically updates your apps and system while your Mac is asleep. Get Microsoft Windows 8 NOW! Wonder if the Surface will be available at the same date? Microsoft has announced that the Windows 8 Release Preview is now available for download in 14 languages. Those who purchase eligible Windows 7-based PCs from 2 June can upgrade to Windows 8 Pro for S$17.99 later on. Windows 8 Release Preview is available for download now. Windows 8 is entering the final stages of development and is on the road to general availability. 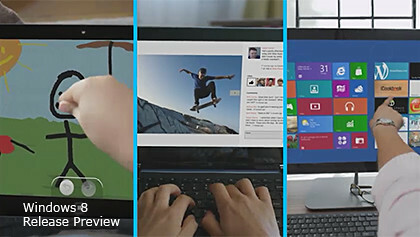 The Release Preview is available for download here, where you can also view a video of Windows 8 in action. Improvements to Mail, Photos and People apps since Consumer Preview. Increased personalization options for the Start screen. Refinements to the way people find and download apps through the Windows Store. New Family Safety features and enriched privacy and security controls when browsing online, including Do Not Track capabilities being turned on by default with Internet Explorer 10. Enriched support for touch with Internet Explorer 10, including a new capability with Release Preview called “flip ahead” that allows users the option to flip between pages with the swipe of a finger, as well as a touch-friendly Adobe Flash Player now fully integrated into IE10. For those planning to purchase new computers that currently come with Windows 7, Microsoft is rolling out the Windows Upgrade Offer program in 131 markets. Windows 8 promises a fast and fluid experience, along with a new user interface that responds equally well to touch as it does to keyboard and mouse. The February release of Windows 8 Consumer Preview was downloaded more than 1 million times in the first 24 hours. With today’s release, it enters its final phase of development before it releases to manufacturing. From June 2, 2012 to January 31, 2013, those who buy eligible PCs with Windows 7 can purchase an upgrade to Windows 8 Pro for an estimated retail price of S$17.99 (including GST). Other offers will be announced later to help those with existing Windows 7-based PCs upgrade to Windows 8. For more details about the Release Preview, check out this inside look from the Windows engineering team. Upgrades to BlackBerry 7.1 (dates TBC) and BBM6.1 (available now), and Visa certification for BlackBerry smartphones. The BBM6.1 upgrade is available now in BlackBerry App World. 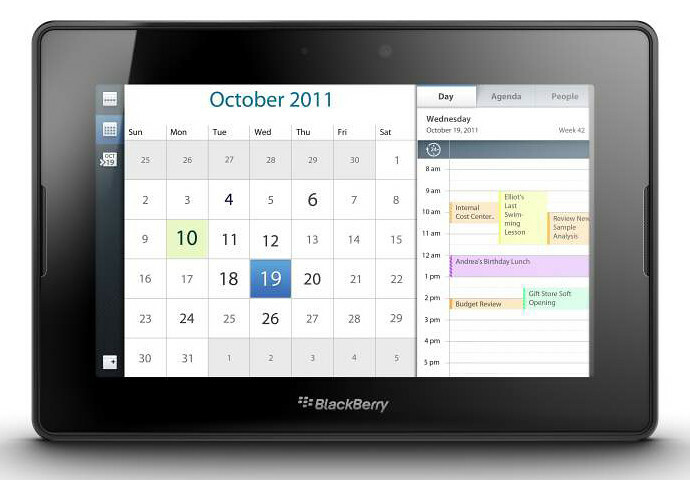 The updates were released by Research In Motion (RIM) during CES 2012. For users of the latest BlackBerry 7 smartphones, some of the features of the BlackBerry 7.1 OS upgrade are described below. Keep smiling with the free BBM6.1 upgrade. 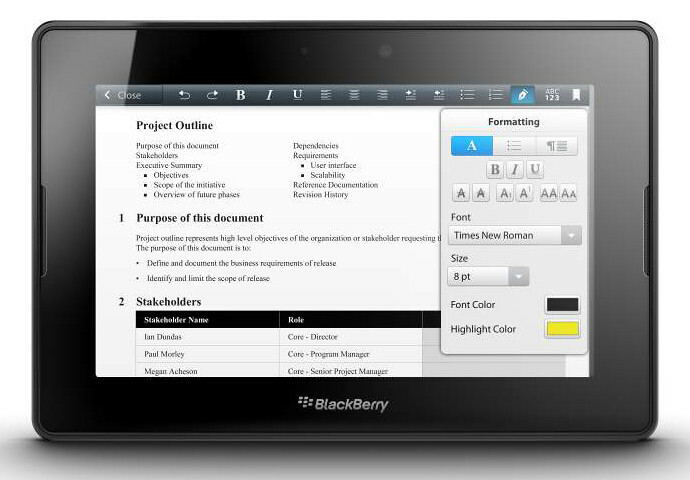 With the addition of BlackBerry Tag, users of NFC-enabled BlackBerry smartphones (incl. Bold 9900, Curve 9360 and Curve 9380) can instantly invite a friend to BBM, exchange contact information, documents, URLs, photos and other multimedia content, as well as pair their BlackBerry smartphone with an NFC enabled Bluetooth device. Turn your BlackBerry smartphone into a mobile hotspot that can be shared by up to 5x Wi-Fi-enabled devices, including laptops and tablets. Universal Search has been further improved to help users find what they are looking for. The enhancement includes an auto-suggest feature that intelligently filters Bing search results to offer users a variety of relevant Web sites based on their search terms. Customers with a BlackBerry Curve 9360 or 9380 smartphones will find a nice surprise with the BlackBerry 7.1 OS update in the form of an FM radio. This upgrade offers support for animated avatars (animated GIFs), a dozen new and fun emoticons to spice up conversations, and the ability to customize chat bubbles with different colors. 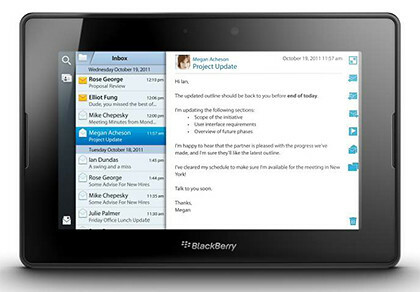 BBM6.1 is available now on BlackBerry App World. In addition, the new BBM app allows users to add customized personal messages of up to 160 characters in their online Profile, more than double the length supported in previous versions. 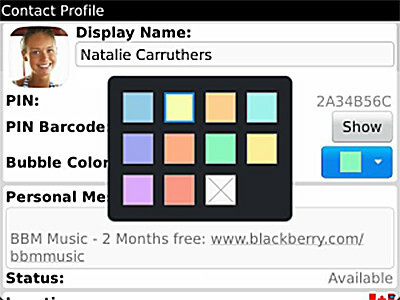 Users can now set the picture for their BBM avatar directly from the camera app – simply snap a picture and select “Set as BBM Display Picture” from the menu. Following the approval of BlackBerry devices as the first certified smartphones of the MasterCard PayPass program, Visa has certified the BlackBerry Bold 9900, BlackBerry Curve 9360 and BlackBerry Curve 9380 as compliant payment products available for commercial deployment by financial institutions. All the new devices certified by Visa can use the built-in NFC (Near Field Communication) technology to facilitate wireless payments using contactless payment terminals.